Nice design with a heavy thick walled construction. Nickel plating over brass. The strainer can be removed from the shaker for easier cleaning. This cocktail shaker is in excellent condition. PARCEL WEIGHT. Our Goal is to see you 100% happy, short of literally bending over backwards we will do everything in our power to make sure you are satisfied. F ake pieces are destroyed and sold for scrap, and anything in need of repairs goes to our jeweler. This was recently cleaned & polished by Tiffany which accounts for the new box & pouch. 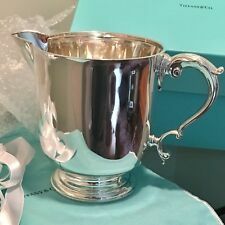 Where do we get all our Tiffany & Co Pieces???. 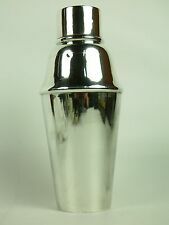 Midcentury Modern sterling silver cocktail shaker. Made by Tiffany & Co. in New York. Curved and tapering sides with incised bands, and gently curved cover. Spare and functional – perfect for pouring over ice. This highly unusual piece revolves around the inner chamber to reveal the ingredients for a range of cocktails aligned to the arrow at the top of the shaker. Seehere here for details. A truly remarkble and very rare item. COCKTAIL SHAKER. SILVER. F.HINGELBERG. 1928 CHRISTIAN F. GEISE. DENMARK. AUTHOR/MANUFACTURER CHRISTIAN F. HINGELBERG F.GEISE. AUTOR/FABRICANTE F. HINGELBERG CHRISTIAN F.GEISE. AUTEUR/FABRICANTE CHRISTIAN F. HINGELBERG F.GEISE. COCKTAIL SHAKER. 1928 CHRISTIAN F. GEISE. PERIOD 1928. Antique 20th Century Chinese Export solid silver cocktail set on tray, shaker of tapering cylindrical form, beautifully applied with a dragons on matted ground, extraordinary quality of workmanship. The shaker has a domed detachable upper portion fitted with a plain cylindrical push fit cover and accompanied with eight beakers in the same style, shaker bears a vacant cartooch to one side. The base is Hallmarked Chinese Export silver 90 (900 standard), Maker's mark (unknown to me). Retailed by Wang Hing (WH), The piece dates to the 1910's, The tray is retailed by Zeeshun. An amazing set for your bar. It has a versatile function and can be used to serve cocktail, coffee or tea. It is Model No. L-845 from the Gorham Giftware line. The long tall cylindrical form is finished in polished brass and features an elegantly shaped black plastic handle. It is fairly heavy for its size and feels solid and well made. Numbered 4 and G99. Art Deco sterling silver cocktail shaker. Made by Frank W. Smith in Gardner, Mass., ca 1925. Tapering and faceted body on stepped foot. Canted shoulder and straight drum-form neck with large spout and built-in strainer, and faceted high-looping scroll handle. Art Deco Cocktail Shaker. They frequently gifted her grandmother with pieces of silver from their collection and this is one such item. It is in excellent condition and ready to use. Marked, "Patented January 11, 1927.". SILVER PLATED ART DECO COCKTAIL SHAKER. STAMPED WS & S 1 PINT MADE IN ENGLAND. This shaker is probably Japanese because of the 950 silver content. This piece is in very fine condition and if used, it was done so caringly and lovingly. A great high quality cocktail shaker for the contemporary bar. Finlandia Vodka Small Cocktail Shaker. Condition is Used, there are some surface marks from use but still in nice useable condition. Belvedere vodka cocktail shaker Used with some surface marks but still in nice condition. For sale is a wonderful art deco cocktail shaker. Impressed marks at the bottom (see picture). Weight about 280g. No cheques. The glasses have frosted glass. The 5 cup shaker is 11 3/4" tall to the top of the lid, the pitcher is 9 1/2" tall, it has a ridged glass handle and a curved top to hold back the ice. Estate sale find. Altuzarra Gold & Glass Martini Cocktail Drink Shaker & Matching 4 Glass Retro Mid Century Set. Shaker with strainer lid and cap is about 11” tall. Glass is about 3.5" tall x 3”. Cocktail shaker set. 1 Pitcher Shaker 2 glasses. Set includes one 9 1/2" tall shaker with glass handle and two glasses 3” tall. The pour spout is threaded and works smoothly. The red and black hand-painted roosters and feathers on clear glass is very good, not faded or chipped. Three pieces: body, lid/strainer and cap. Estate sale find. Vintage Art Deco Silverplate Zeppelin Blimp Cocktail Shaker, Vintage Barware Bar Airship. Condition is Used. Shipped with USPS Priority Mail. Restoration hardware made in India , has tarnish spots it may come out with better stuff still has sticker on back very clean inside and shiny inside and heavy it will be wrapped very good please see pictures closely and if ya got any questions please ask ..i will help as much as i can ,,, thank you. 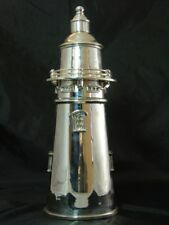 SILVER PLATED ART DECO COCKTAIL SHAKER. For sale is a Very nice WOLFF Cocktail Shaker. From what i can find online these were made from the 1930s to the 1950s ???. Vintage Cocktail Shaker Glass w/Mixed Drink Recipe Retro Graphics 9" Chrome Lid. Condition is Used. Shipped with FedEx. Art Deco Cocktail shaker, glass and chrome. By Hazel Atlas, late 40's, so Mid Century!! Fabulous Deco Graphics of cocktails and glasses! It is in near mint condition, no chips or cracks, good paint and the chrome top is bright and shiny with minimal surface wear. The shaker is 9 ½” tall and 3 ¾” at the widest diameter. Beautiful Display piece! Practical, too... Have a retro martini party next weekend! Ruby Red cocktail shaker from the 1930's. Excellent condition and it is hard to find any defects on this item. Mirror aluminum & Stanley swirl mixer. This is a very nice and unique set of six cocktail shot glasses with leather case. There are three larger shot glasses that are 2 1/4" wide x 2 3/4" tall, each one nest inside the other. Then there is a shot glass that is 2" x 2". Restoration Hardware Nickel Plated Polar Bear Cocktail Martini Shaker 10½" Tall . Condition is Used. Shipped with USPS Priority Mail. This is six piece Hazel Atlas Dancing elephant martini set that includes the shaker with pour spout and five small cocktail glasses. They are in excellent condition with little signs of wear. Great bar ware set. Made in England by2 PHV Co. Minor surface scratches only. ART DECO. 835 SILVER COCKTAIL SHAKER BY A.F. RASMUSSEN. EXCELLENT CONDITION. ALL PART FIT VERY WELL AS SHOULD AND TO PREVENT SPILLAGE OF DRINKS. HALLMARKED UNDER BASE. NICELY DECORATED. THIS SHAKER WEIGHS IMPRESSIVE 472 GRAMS OR 15.19 TROY OUNCE. Lid fits tight and seems to have a good seal. This would be a cool gift for a firefighter. It does have two hole in the base but they don't affect the function of the flask. Beautiful French Art Deco silver plated cocktail shaker. 10" high, 6" wide. Made in Canada. SP, EP Copper, BMmts, 404 on the bottom. Lid has a cap that covers the central strainer/pour spout. Estate sale find, not marked for maker or age, my best guess on the date of manufacturer is during the 1960s.